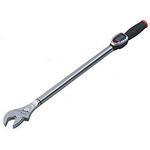 Digital Adjustable Torque Wrenches expand torque applications to places where a socket wrench cannot work. They feature forged steel jaws and a unique power sensor in the handle which accurately detects and analyzes load applied to the grip, regardless of hand position and specially designed jaws that maintain a constant working length whether open or closed, to enable more precise torque measurement. The best known, rugged, high quality tools for over 60 years! Rigid Ergonomic Grip with Unique Power Sensor - keeps the load point in the center of your hand. The built-in sensor accurately detects and analyzes load applied to the grip to enable more precise torque measurement regardless of hand position and skill level of the operator. Large LED Lamp - is easily visible even from the side. 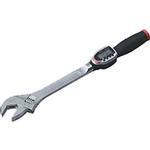 These torque wrenches measure in peak mode, peak with auto zero reset, and real time. Five programmable torque presets stored in memory enable the user to check frequently used values. The presets alert the user with an intermittent signal at 90% and a continuous signal at 100% of the preset torque value using LED?and audible indicators that enable users to tighten to within 10% of a preset torque value. Pass/Fail mode counts the number of fasteners tightened within programmed high and low torque limits. Selectable units of lbf-in, lbf-ft, kgf-m, and N-m. Uses a lithium coin battery, CR2354.